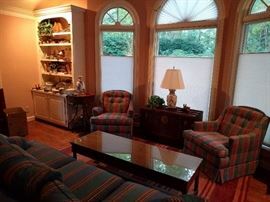 AddressThe address for this sale in Atlanta, GA 30328 will no longer be shown since it has already ended. We accept cash, credit & debit cards as payment, with a 3% credit card fee - nothing's free, someone has to pay for those sky miles. We're a legitimate business, so we DO charge sales tax. We have a few boxes available, but if you feel motivated, please bring boxes and packing material - you'll need them! Always bear in mind that we're an estate sale company, not Nieman's. Please make an effort to bring your own muscle (gardener/house boy) to load heavy furniture. 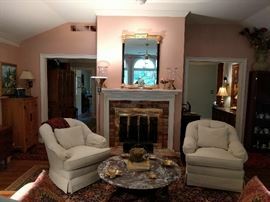 Very nice living room, with pair of Sherrill Carved French Louis XVI Style Open Arm Upholstered Chairs, gorgeous Persian Heriz, Asian wood/beveled glass coffee table, pristine Frederick Edward camel back sofa, authentic Asian etagere, Pair of vintage Asian porcelain lamps, Sherrill one-drawer end table, huge, crackle finish beveled glass mirror, celadon umbrella stand. 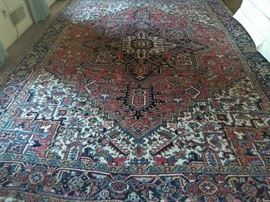 Gorgeous 50-year old Persian Heriz, 100% wool, hand woven, measures 12'-8" x 9'-8". Vintage wooden Asian chest, w/carved front panel, one of a pair of beautiful porcelain Asian lamps, collection of Virginia Metalcrafters leaves, Baldwin brass candlesticks, vintage Lenox compote. LOVE this! 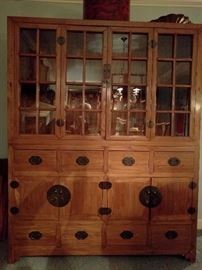 Two-piece china cabinet, made... in China! UNBELIEVABLE custom ordered table, hand made in Macau. 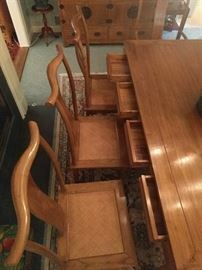 The table top is a single piece of wood, the chairs are an exact copy of Ming Dynasty chairs (6 sides, 2 arms). Very kid-friendly, as there are four drawers on each side of the table, for their favorite foods, such as beets, brussel sprouts, sauerkraut, broccoli, cauliflower, braunschweiger, liver, etc. They just open the drawer when you're not looking and, voila, they have cleaned their plate and earned pudding for dessert! See? Here's the secret drawers all kids dream about! Another custom made piece of Asian furniture, made in Macau. 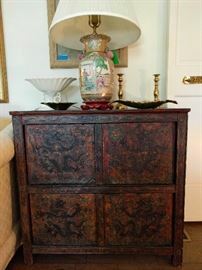 Gorgeous Asian chest, custom made in Macau. It really is a beautiful piece of furniture. A small part of the sterling silver at this house. The 3-piece tea set is "Plymouth" , by Gorham. Deluxe Drexel MCM mahogany buffet, with pair of heavy brass lamps, watched over by an original oil, artist signed, of Bourbon Street, New Orleans. Another very nice Asian bookshelf, purchased in Hong Kong - heavy! Very nice, pristine condition 1940's mahogany drop-leaf table. This is a very cool piece. The two doors open to reveal three drawers. You'll see it opened in the next pic. If I wasn't a slight hoarder of great stuff (no more room in the inn) I'd buy this! Beautiful Persian Kashan, 100% wool, hand woven, measures 11'-10" x 8'-5"
A wonderful pair of custom made, illuminated wine cabinets. The next pic shows them opened. Wow, what a great idea for a bar! It's a vintage 1970's TV cabinet and super heavy. Next pic shows it revealing the candy within... ALWAYS hide your candy. This is really an extraordinary pair of Chinese scroll ancestral portraits. These were purchased in Hong Kong and the story is, that these type of portraits are painted after the person is deceased. They are not cheap. We'll call him Wang Lung. They measure over 4' long. Here's his wife O-Lan, I'm assuming. Great frames and the painting detail is quite impressive! 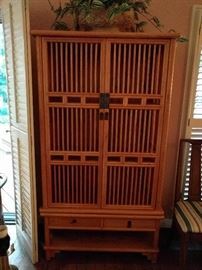 Tommy Bahama-esque louvered linen press, entertainment center thing. It's an open and shut case, just review the next picture. This thing is super heavy and will outlast a Tsunami! Hand woven, 100% wool Persian Kurdish Bidjar, measures 3' 9" x 6' 5". Aha! Here it is! The third wheel bar height table and chair set you've been scouring the internet for! This is a gorgeous hand-woven, 100% wool Persian Bidjar rug, that's at least 60 years old. The colors are fabby, condition very good, with even pile; measures 4' 2 x 6' 4". 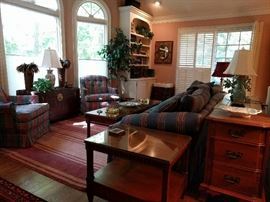 Downstairs entertaining was never so swanky as this comfy vignette! 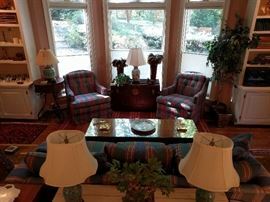 1980's metrosexual lumberjack plaid sleeper sofa, flanked by a pair of peachy-keen upholstered armchairs. The mahogany coffee table is unmolested by errant binge drinkers, rescued toy poodles or rug rats. It even had a beveled glass top to keep your narcissistic friends entertained during Tupperware parties. 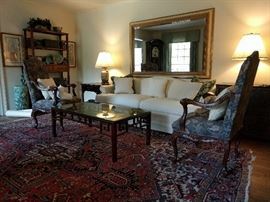 Hand woven, 100% wool Indian rug, Agra design, measures 8' x 10'. Hand woven, 100% wool hand woven Persian Heriz, measures 8' 2"" x 10' 6". Matching mahogany highboy, by Kling Furniture Co., Mayville, NY. This is one of a pair of very nice contemporary prints, by Peter Kitchell, artist signed, well framed and matted. 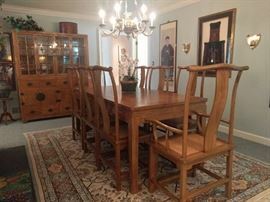 A dining room FULL of very nice collectibles, lot's of silver plated hollowware and some good pieces of sterling. OK, you know allll about the cuckoo clock, but you DON'T know the untold story of the antique spool chest on stand. Don't ask me, I don't know either. I just make all this stuff look purdy, hoping you'll buy everything. Ahh, now here's yet another rug you won't see very often. It is a hand-woven, 100% wool 19th century Persian Ferahan Sarouch. 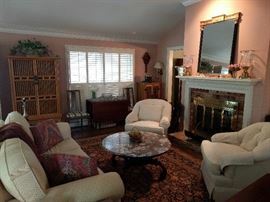 The colors are luxe, condition very good, with even pile; measures 4' 6" x 6' 6".